The Muffle Furnace is used to determine ash content of materials like Polymer, Polyethylene, Polyester, Nylon, Cork, or any other material. The Muffle Furnace has robust Construction with muffle of high-grade refractory wound Kanthal Heating Elements, Sealed with embedding cement. Temperature is controlled by Digital Temperature Indicator and Controller fitted in the base front panel of the Muffle Furnace. Front Panel of Muffle Furnace has two indicator lights. Designed to operate on 220 Volts, single phase 50 Hz A.C. The casing is made of thick mild steel sheet reinforced with angle iron. Maximum Temperature of Muffle Furnace 1000 to 1450 Deg C and excess temperature cut off fuse is provided in the Furnace. Our Electric Muffle Furnaces are suitable to maintain temperature with accuracy of 1%. Electric Muffle Furnaces are also used to find the ash content of the product, heating of metal parts and other applications of high temperature treatment. Electric Muffle Furnace has door with clamping arrangement. 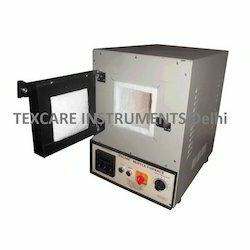 Muffle Furnace offered is used in hospitals, research centers as well as in other institutions and feature rectangular shape and light weighted finish. With the furnace fabricated using heavy M.S plates, these also come with heavy double walled door with use of ceramic wool so as to provide for better insulation. We are manufacturer and Exporter of wide range of Electronic Muffle Furnace, they are used in all industries for different High Temperature Applications and curing. 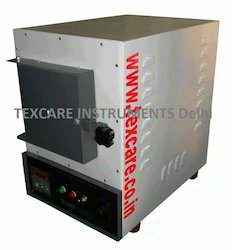 Electronic Muffle Furnace is fully operated and controlled by microprocessor based Digital Temperature controller. 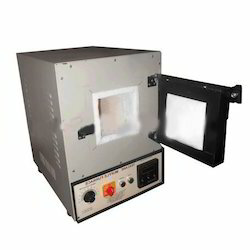 This Electronic Muffle Furnace is in high demand of all industries, institutes and research laboratories. 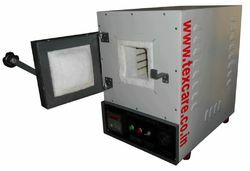 We are providing a superior quality of Laboratory Muffle Furnace.